"From the Heart, for the Herd, Part 1"
Dimension X, the past. As the Triceraton forces board a dropship for another mission, a single Triceraton child is left behind by his parents to remain with their Utrom masters. The dropship is subsequently destroyed and the last Triceraton child eventually grows up to become General Zog. Years later, an alien planet. General Zog receives word that Commander Zom is almost done wiping out the last of the enemy forces. True to the intel, Zom kills off the last few aliens and then meets with Zog for a debriefing. She has taken on a light injury, much to Zog's concern, and they hold hands. The Triceratons return to Utrominon and are greeted by Genera Krang, but not Emperor Quanin. Zog goes to have a meeting with Krang while Zom heads to the archives to update the Triceraton roster of with the deceased. At the meeting, there is a heated exchange of words between Krang and Zog; Zog dislikes being a tool of the Utrom Empire but Krang reminds him that it was the Utroms who created the Triceratons in the first place. Furthermore, he reminds him of how all other Triceratons had died in battle and without the Utrom cloning techniques that they used on Zog, there would be no Triceratons now, either. As they part, Krang warns Zog that once Quanin is gone and he is in charge, things will be very different. At the Hall of Archives, Utrom Supervisor Mifor gets impatient with how long Zom is taking to update the record and tells her to lock up when she leaves. Zom notices that Mifor left his station logged in and begins reading through the classified file on Zog. What she sees horrifies her. Mifor returns and catches her reading his files and tries to call security, but Zom grabs a weapon and kills him. Later, Zog receives a message from Zom. She vaguely reveals that she has learned some startling news and she has only one recourse left: To kill General Krang. Triceraton Training Compound Alpha, Utrominon. The Utrom Commander Grel gathers all the young Triceratons for their first day of droid combat training. The youngsters excel in their training, but accidentally knock Grel out of his hover pod in the process. He's plucked up by Zog, who puts him back in his pod. Zog remembers his own training with Grel and remarks that the new Triceratons have a lot to learn about discipline. *This issue is continued from TMNT Universe #15. 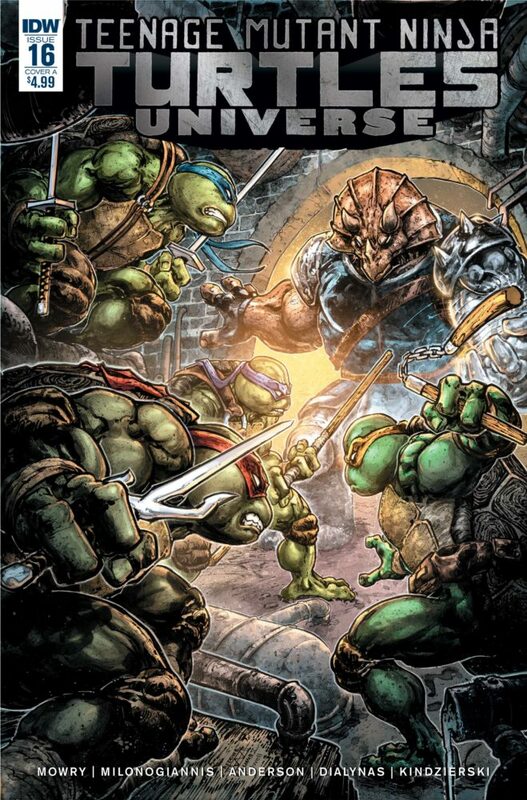 The storyline continues in TMNT Universe #17. 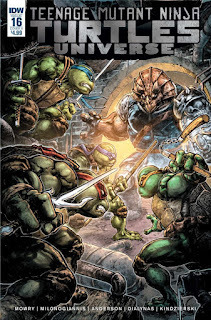 *This storyline takes place early in the past-set events of TMNT: Utrom Empire #1. *This storyline was originally titled "Freedom", which appeared in a few of the early solicitations (including the one on the IDW website). It was later changed to "From the Heart, for the Herd". *This issue was originally published with 3 variant covers: Cover A by Freddie E. Williams II, Cover B by Giannis Milonogiannis, and Incentive Cover by Jake Smith. This new arc in Universe seems like it's trying to perform a sort of double-duty. It's a prequel to Paul Allor's Utrom Empire miniseries, providing important background on the Triceratons, while also tying into the current "Invasion of the Triceratons" arc going on in the main series, giving us an origin for Commander Zom. As a character study on Zom, I think it's working out a lot better; she's the focal Triceraton of "Invasion" and getting a glimpse into her complicated past gives her a bit more dimension. As a prequel to Utrom Empire, I'm a bit less convinced. I'm sure Chris Mowry read Utrom Empire before writing this storyline, though I'm having a hard time seeing where this story takes place in conjunction with that one. Krang as he's seen here is dismissive of the Triceratons, outright disliking them. 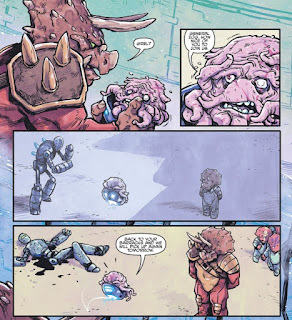 In Utrom Empire #1, Krang was shown to be all buddy-buddy with the Triceratons, going so far as to party with them upon victories. You could say that this story takes place after the events of Villains Micro-Series: Krang, where Krang gained his more diabolical personality, but he's not walking around in his robot body made out of Traxus' corpse, so it can't be after that. I think a lot of "From the Heart, for the Herd" relies on readers sort of... forgetting about what they read in some of those much older stories. You just need to forget that Krang was ever friends with the Triceratons and that he used to be a less-than-sinister weakling. There's also the sudden retcon that all the individual Triceraton died, save Zog, and all the Triceratons since then are clones. The vaguer your memories of Utrom Empire, the better. But it's kind of hard to get over that. Krang and Zog having once been pals was an important part of the Utrom Empire storyline. That arc covered the rebellion, partly led by Zog, which ultimately resulted in Quanin's death and Krang having to retreat to Earth with the remains of his people. But the only reason Krang LIVED was because Zog, on two separate occasions, spared him out of memory of their previous kinship. Zog kept letting Krang go because he felt Krang had the capacity for reason and mercy, and the only reason he thought THAT is because the two of them used to party together. But you see none of that in their exchange in this issue. Krang keeps reminding Zog to address him as General and not to forget his place. He shares a lot of personal grievances with Zog, yeah, but it all just seems to make Zog hate Krang more and more (we see him shaking his fist when Krang's back is turned). I can't see Zog, after having these sorts of encounters with Krang, sparing his life twice during the rebellion later on. Ignoring continuity, though, is this a good story so far? Well, it throws you into the deep end of the IDW TMNT mythology and it definitely does expect a working knowledge of continuity to follow. So disconnecting it from all of that and trying to enjoy it in a vacuum isn't so easy. I am happy to get more Zog, who we've seen very little of in the IDW series, and I appreciate any sort of background on Zom we can get, but the expectation of the reader to both remember important parts of continuity and forget what's inconvenient is irritating. As for "Triceratots", I dunno. It was cute? A little, anyway. I did like that layout of past-Zog training alone and then flash-forward to the present, where we see all the little Triceratons training together. A small reminder of what a lonely childhood Zog had. But that's the most remarkable thing about this back-up and it isn't even that remarkable. It's getting to the point where this almost has to be a parallel universe from what was portrayed before. And given how much time travel has been involved up to this point (both in Turtles in Time and in Bebop & Rocksteady Destroy Everything), it may not exactly be far-fetched. 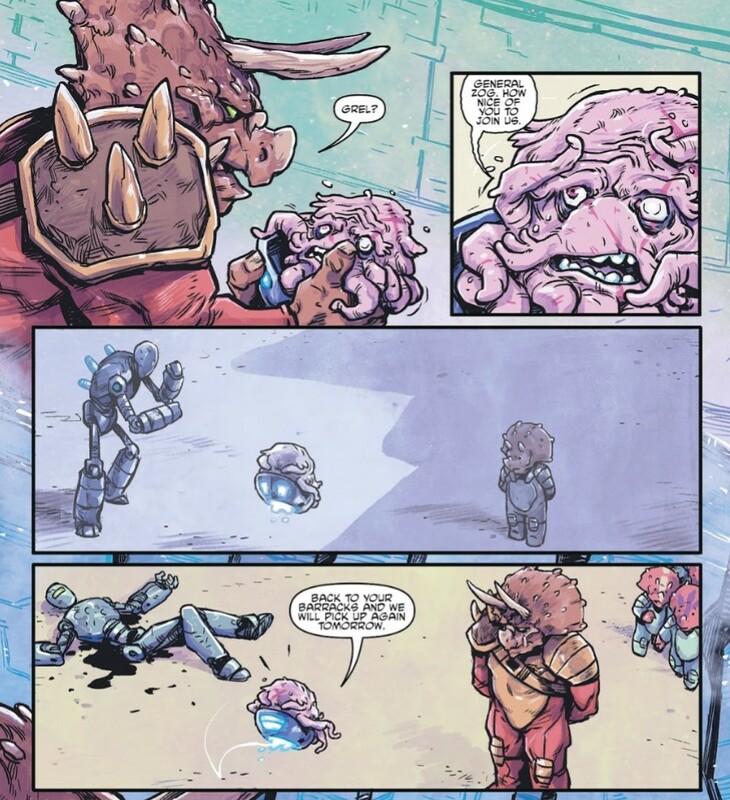 It may even be that the Krang from Utrom Empire was and is from a slightly different parallel universe than the Zog and Zom of From the Heart, For the Herd. Why do I say this? Other than the fact that that Zog was consistently colored grey in those full-color stories, you should also read Universe #17 and there are more departures from the established story that I will not discuss here. But I'm already used to this kind of thing. The 2012 TV series would seem to casually retcon its subtler details so much (most likely because of a revolving door of writers and constantly shifting production priorities) that it became easier to just imagine that the different seasons took place in a slightly different parallel universe. Such things are just harder to get away with in comic books, because its readers have lower audience turnover than television and thus tend to have longer memories for continuity. So I'll be disappointed if this retconning Triceraton story doesn't have some kind of multiverse explanation, like how Mirage had two parallel Splinters who swapped places after meeting in the Battle Nexus, which suddenly provided a plausible explanation for why one Splinter's premonition of his own future death (in volume 2) was different from the way the other Splinter actually died (in volume 4). Triceratots? They're just adorbs, like Turtle Tots. :D That's all the justification that story needed, and it was worth it. You pretty much hit all of my points on why this failed continuity-wise on the head. Except for something I completely forgot: that Krang was pretty friendly with the Triceratons. "Trusting them enough to get wasted around" friendly. I was not really a fan of the arc, mostly for the glaring continuity issues. I like to imagine that the differences in the stories are based on the memories of the characters, that could be not exactly what happened. 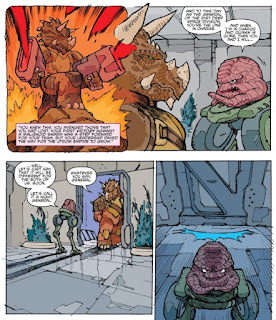 Utrom Empire is based on the memories of Krang, so he pictured himself as a a benevolent leader. From the heart, for the herd is instead based on Zog's memories. One thing I should add is that this is still most definitely after the Krang micro. Just because he has the Traxus suit, it doesn't mean he's using it all the time. He had just been appointed General, so he's likely a great deal older than he was in the micro (Bobby Curnow estimated an 19-20 zone, but I personally like to think he was in a 16-17 range). There also didn't seem to be any Triceratons during the time of the Micro either.